What was the special significance of this image? 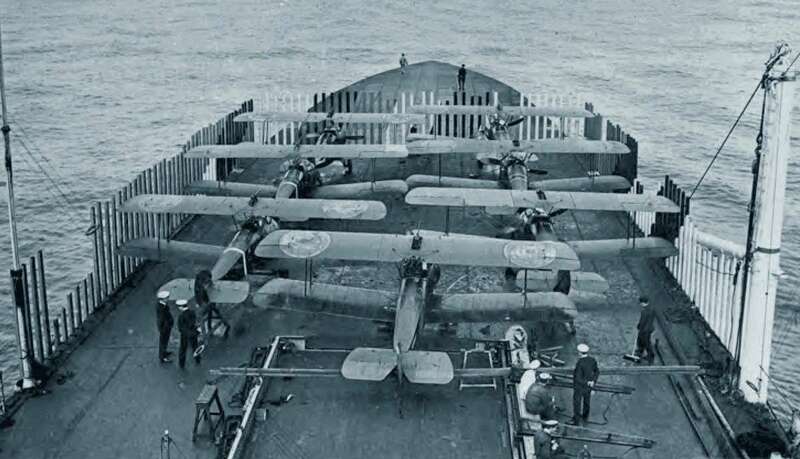 The image was taken aboard HMAS Furious on 19 July 1918 – just over 100 years ago – and showed a number of Sopwith Camel 2F.1a aircraft parked on the foredeck. They were about to take part in the first air strike in history from a carrier – on an airship base in Tondern (then part of Germany). HMS Furious in 1918. Photo via William Casey. Furious was originally a Courageous class battle cruiser built for the RN during the first world war. It was lightly armoured and designed with only two heavy guns (18 inch) one each fore and aft. During construction the forward 18-inch turret was replaced by a hangar and sloping flight deck that reached the forecastle, with two derricks to hoist aircraft aboard. Although the deck was designed as a fly-off deck only, Squadron Commander Edward Dunning twice successfully landed a Sopwith Pup on it by flying past the superstructure and then ‘sideslipping’ onto the deck, where the aircraft would be arrested by various hands assembled there. Tragically he was killed on the third attempt. You can read his story here, including a link to a video of the actual accident. Furious went back to the dockyard in December 1917, where the rear gun, magazine, mainmast and various secondary arms were removed, leaving the funnel and centre superstructure intact. A second flight deck was added on the same level as the forward one, together with a box hangar. Vertical cables at the forward end of the aft deck prevented aircraft from striking the superstructure – an early crash barrier. Unfortunately the after deck was subject to severe funnel turbulence and during landing trails only three of thirteen attempts were successful. Landings were therefore prohibited. After WW1 the superstructure was removed in its entirety to give her a full-length flight deck. From the beginning of the war Zeppelins had been a constant threat to both shipping and land targets. On 17 July 1918 Furious was dispatched to conduct an air strike on the Imperial German Navy’s Airship Division at Tondern (then part of Germany). It was the first attack in history by aircraft launched from a carrier. It was originally planned to use Sopwith 1½ strutters in the attack, but these were too valuable for reconnaissance tasks and Sopwith Camels were substituted. After a delay due to weather, seven aircraft were launched just after 0300 on the morning of 19 July, some distance from the Danish coast. One aircraft was forced to turn around with engine trouble and subsequently ditched, being run over by HMS Viceroy before the pilot was rescued. The remaining six pressed on and reached the enemy base at about 0435, taking it completely by surprise. Captain Dickson, in the first aircraft, dropped the first of his two 50lb bombs from 700 feet, missing the target. All three aircraft of the first flight then pressed home their attack with at least some bombs striking the target(s) (there were three hangars, each capable of housing at least one Zeppelin). Having exhausted their bombs all three aircraft departed for their ship – Dickson’s report noting that he located the first destroyer at 0545 and, after circling it, landed on the water and was rescued by HMS Violent. Captain Jackson fared less well, with his engine giving trouble on the way home. At 0535 it stopped completely but from 10,000 feet he was able to find a bit of coastline and crashed into a fence hear Guldager. He burned the wreckage, documentation and maps before being captured. Lieut Williams, the third pilot of the flight, also crashed (near Esbjerg) but was unable to destroy his aircraft before the arrival of the local police. Both pilots were interred but Jackson eventually escaped and got back home. 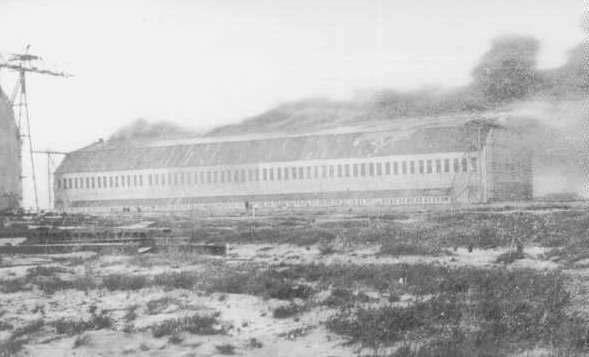 The aftermath of the raid with smoke billowing out of one of the three hangars. Photo: via William Casey. The remaining three aircraft found the target at 0445 and pressed home their attack on the two hangars not yet burning. After departing, one ditched near the fleet, one crashed near Esbjerg (where he joined Jackson and Williams) and the third, Lieut. Yeulett, was never seen again. During the attack two German airships and one captive balloon were destroyed. Although the Germans repaired the hangars quickly Tondern was abandoned as an active base and kept for emergency landings only. Defences at other bases were improved, but the British did not conduct any other carrier strikes for the remainder of the war (although others were planned). You can read the story in far greater detail in an excellent on-line article by Willian Casey here.